The "Good News" thread. - page 73 - general non-furry discussion - Furtopia | Family Friendly Furry Forum and IRC Chat! A friend of mine mowed my yard. Now that is good news. I got Copic markers for my birthday a couple weeks ago and I've been super busy making new art! A raise of 2% goes in effect for me and most of my coworkers next month. 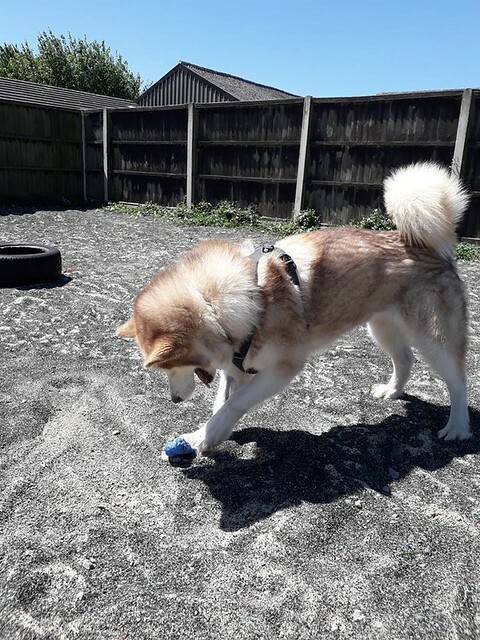 I spent my day at a local animal rescue centre, playing with a 7 year old female malamute named Kimba. My friends are adopting a 7 year old male eurasier from there (a super-fluffy, medium-sized Spitz breed from Germany) called Kronus, and have their home visit to check their house is suitable on Thursday. "Wow, that thing actually works?!" A brother managed to pass four kidney stones mere hours before he was to see the urologist. We are getting a bit of rain, and it's so much cooler too. I have a job for the summer! Also, I'm stage directing a play my uncle's producing! I adopted this little guy! Weisse and I are going shopping at the weekend to buy a load of collars, tags, toys, bedding and food for Kimba. My new certification from the DEQ arrived today. You plan on making your own fursuit or commissioning someone? 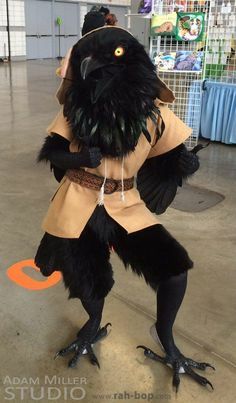 What kind of bird costume? Dog. A female mostly-alaskan malamute. Abandoned by her last owners, left to roam stray with her mate and son (both now sadly deceased). She's been home a few days now and is settling in, slowly but surely. We're trying to get her over her fear of cars and roads - we think she had a few near misses with cars when she was stray. Friends in town, and they've invited me out to dinner. I'm going to make my own. It's going to be an avian, naturally. Something like a wingless griffon. There'll be fur on the front, feathers down the back, a bird head and digigrade feline feet. 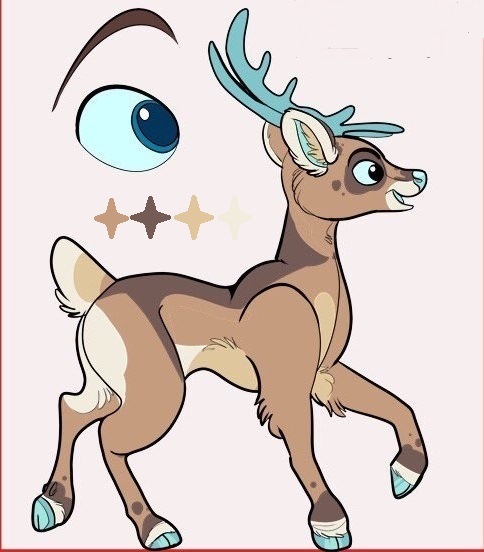 It won't be a full fursuit, it'll be a partial, but I intend to fashion a set of clothes for the character for her to wear that'll be all her own. 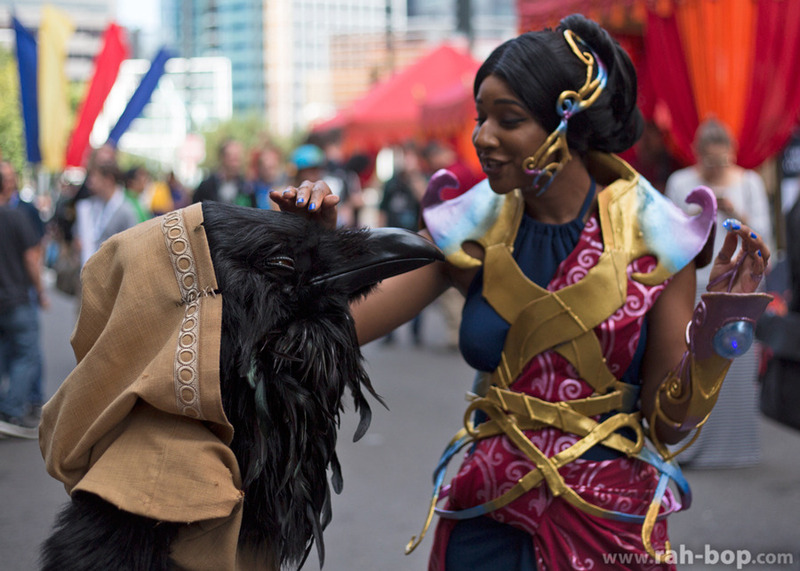 I was inspired by Rah-Bop on tumblr and her Kenku Rue. I have studied her designs carefully and have been experimenting in some puppetry to make a character that will be able to open and close its eyes by tugging or pushing on an ornamental decoration I'll be wearing like a necklace. 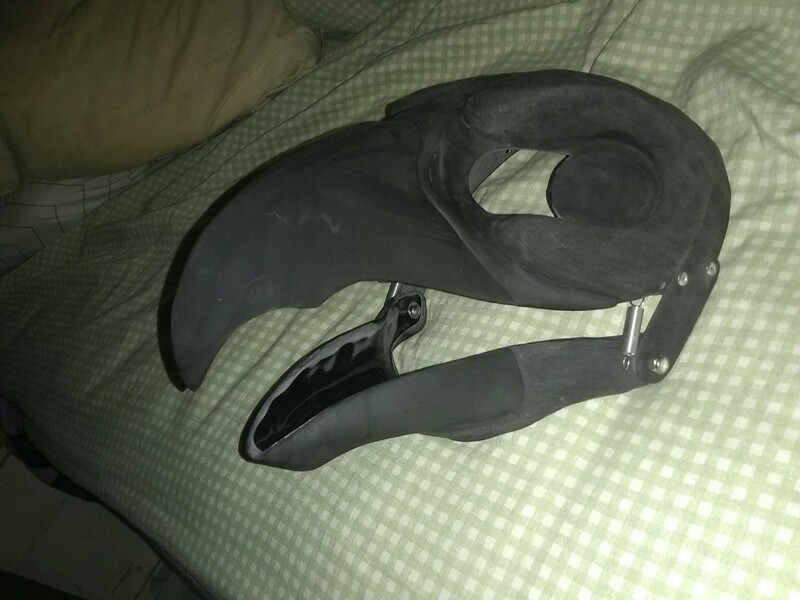 Had originally intended to take some Jurassic Park dino masks and sculpt clay on them to make them into birds but my boyfriend decided "why go to that work, there's masks you can get online." 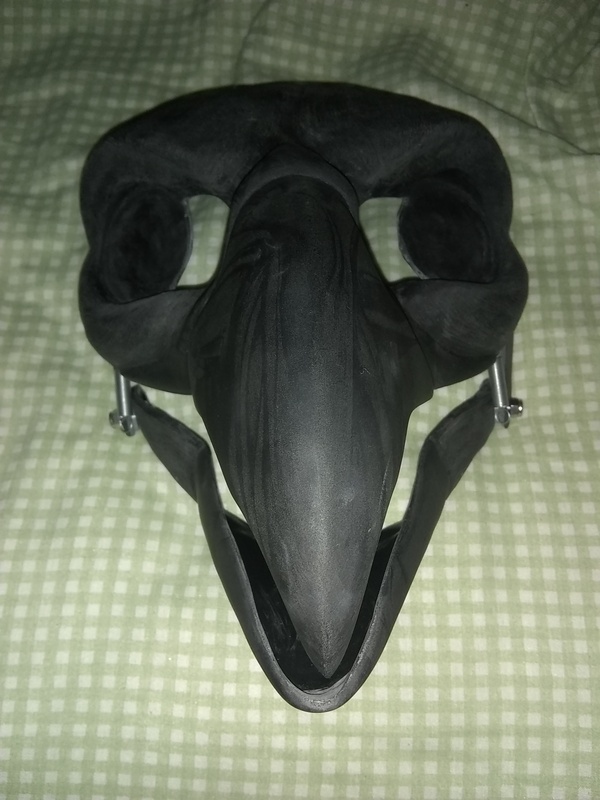 It's a dreamvisions creations mask too so very nice quality. Good luck on the suit, Kay. Hope it works out for ya. I've seen suits similar to that in the past. 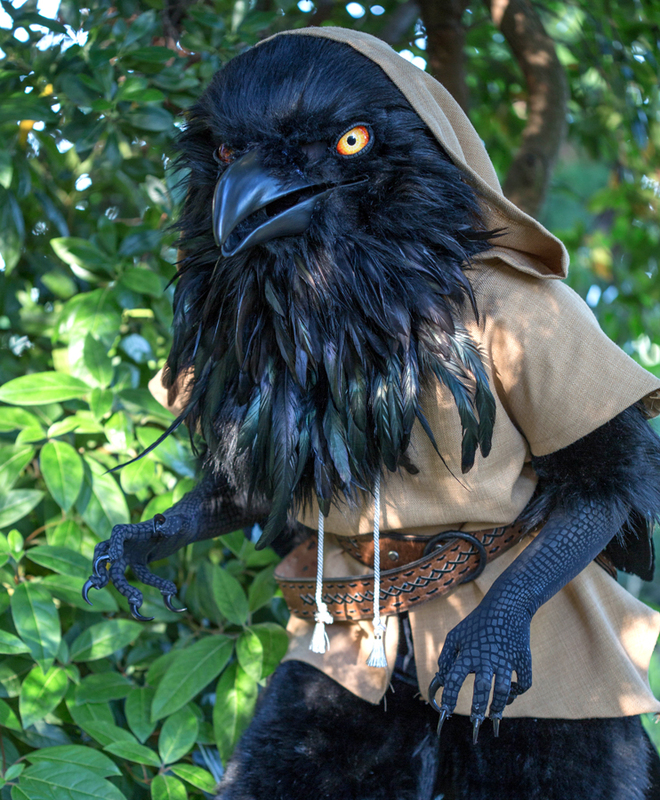 I've thought about getting a bird fursuit, but times have changed and I no longer have the resources (money) like I once did. I'm thinking that a suit like that must be at least somewhat less hotter than a full fursuit since the lower arms and lower legs are covered in a spandex bodysuit or other clothing instead of being covered by fur fabric. Only thing I don't like is the hand claws as they seem too long. Be a royal pain trying to grab something or if a claw broke, etc. Payday on Weds. I can hardly wait. We have a dog behavioural therapist coming on Friday to evaluate Kimba and work out a treatment plan for her fear of cars and roads. Kimba's pretty! I'd say use Ceaser Millan but it'd be hard to get him. My good news is it's Eevee's birthday/adoption day! The trainer we have actually did her training with and uses the methods of Caeser Millan. Kimba had another session today, working on lead walking and more advanced car stuff, and she is showing very good improvement. All her walks are now going to be on the slip lead, and we're starting to shut car doors with her inside the car. Won $20 on an instant lottery ticket received on my birthday. Also a $15 gift card. Sometimes, it pays to be in the right place at the right time. I wasn't planning to go to my local library today, but I made a quick stop just for the hell of it to see what new DVD's were available to check out. Also took a quick look at the "For Sale" section where the library sells off old, used, and/or donated books, music, and DVD's. And what did I happen to find for sale? The complete Season 1 of Game of Thrones on Blu-Ray! Normally, I'm not a GoT fan/watcher as I never got into the series years ago. But my curiosity got the better of me and I decided to purchase the 5-disc Blu-Ray set.......for $1.00! Yep, you read that right. $1! And the complete set is in very good condition too.